Volunteer Profile: Tony Scully - TADSA - Technology for Ageing and Disability (SA) Inc.
Tony joined TADSA in 2003 as Technical Volunteer but very shortly after became Assistant Project Coordinator to the late Roger Davis. In 2005 Tony became a member of the TADSA Management Committee and for many years held the position of Committee Secretary. When the TADSA Committee Chairman resigned unexpectedly in 2016, Tony became interim Chairman. This was at a particularly challenging time as the Committee was amending the TADSA constitution in preparation for the organisation to move to a Board management structure. Tony became a TADSA Board Member until he stepped down in 2017. While serving on TADSA Management Committees/Board, he was also the Freedom Wheels Coordinator. 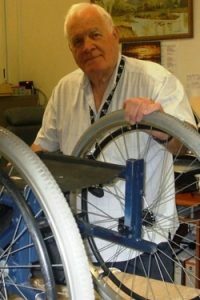 When TADNSW offered TADSA the Freedom Wheels modified bike program in 2008, Tony was very excited by this opportunity and became the program’s Coordinator, a role he held for several years. After retiring from work, Tony and his wife Jean undertook the big around Australia trip. On their return Tony would ask Jean “what are we doing today?” Jean knew that she had to find something for him to do. An ad in the paper looking for Father Christmases caught Jean’s eye and subsequently Tony played Father Christmas at some of Adelaide’s biggest department stores. Unfortunately, Jean says with a laugh “that’s only six weeks of the year isn’t it – you’ve got the rest of the year.” Then Jean spied an ad for TADSA and Tony found his niche. Tony knew he could use the skills and experience he gained in his working life to help others. Tony was apprenticed as an instrument maker to a company in England called Venner which made parking meters (some of which were exported to 50 countries including Australia). Before he left to move to Australia, Tony was making micro diodes, and transistors. This came in handy because when he arrived in Adelaide, he went to work at Philips at Hendon making micro diodes, transistors and integrated circuits. Tony worked at Philips for 30 years rising to the position of Production Engineer. Tony’s most memorable project is our Freedom Wheels bike program. In 2008, TADNSW CEO Joy Barrett visited TADSA with a bike and accessories and Tony immediately wanted to be involved. “For the first two years fully assembled bikes were sent from Sydney for our TADSA clients. As we got more familiar with the accessories and the types of bikes that were suitable for modification, we did everything ourselves, organising clinics, buying bikes and just ordering the accessories from TADNSW” Tony says. What Tony really enjoys is the joy and smiles the bikes bring to the children some of whom arrive at a clinic using a walking frame and within minutes are “tearing around the place”. The reaction of parents is also special, as some get quite emotional at seeing their child ride or the first time.